Do you have old 'tired looking' garage doors, perhaps becoming more difficult to open with age or needing clear space inside or out before opening? Then why not consider upgrading with modern roller garage doors rather than just replacing with same type? At the Roller Garage Door Centre we can help - whether you are looking for garage doors to install yourself or have us professionally install them for you through our UK network of garage door installers. We specialise in providing only roller garage doors as we feel these are more beneficial in not only operating within a limited space compared to panel and up and over doors, but provide a better level of security and deterrent against would be intruders. They also benefit from a smoother, quieter operation and should a door ever become damaged only the dented slats need replacing. All our roller garage doors are CE marked for safety and the motor is backed by a 7 year guarantee (please refer to brochure for full details). Remember, we are never knowingly beaten on price! On each of our garage door information pages you can view our low cost prices. If you see a better price for the same roller shutter garage doors showing elsewhere then please ring us - we are confident we can beat any advertised price! Our electric garage doors can be automated for the ultimate ease of use and are manufactured to a quality to ensure safety and reliability for your peace of mind and are supplied with two remote controls, using rolling code technology, and an internal manual override in the case of a power failure as standard. All our roller garage doors are made to fit to your measurements with door slats constructed from high grade corrosion resistant aluminium with a CFC free foam core for thermal insulation and noise reduction.75mm Guide Rails are supplied as standard for all doors up to 4600mm. Doors over 4600mm wide come with 90mm guides. Either as DIY garage doors or fitted by our installation teams, we supply industry leading products at great garage doors prices. Roller garage doors have no top box as standard but we can supply half or full box options. They are available in a range of low maintenance colours. Details and options can be found on each door type page. Our manual or electric roller shutter garage doors and sectional garage doors not only provide secure protection but save space inside the garage and more space when fully open. You can park inches from the door yet still allow it to be opened safely. The boxhead requires just 205mm headroom inside the garage for doors up to 2150mm, 300mm for doors up to 2500mm opening height and 350mm for doors up to 3500mm opening height. You can download our latest Seceuroglide roller garage doors brochure covering the full range of doors and options. Installed outside of the opening with restricted internal headroom (not Excel Higher Security). Maximised internal space whilst not obscuring exterior (not Excel Higher Security). Download our latest Seceuroglide roller garage doors brochure covering the full range of doors and options. Measure the Overall Guide Width (includes guide rails) and Guide Height for pricing. 75mm Guide Rails are supplied as standard for all door widths up to 4600mm. Doors over 4600mm wide come with 90mm guides. 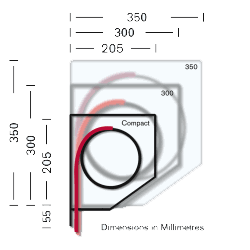 The Total Height is the Guide Height plus the Headroom needed for the top box end plate. 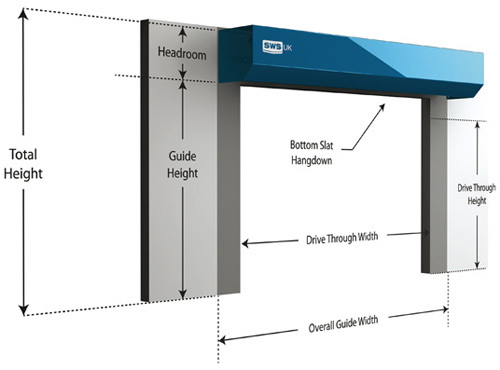 Ideally measure in two places to allow for any misalignment of your existing opening. We recommend 55mm of bottom slat should hang down into the guide rails when the door is fully raised. Below this is the Drive Through Height. © Roller Garage Doors Centre. Part of the Access & Security Systems Ltd Group. All Rights Reserved. Registered Office: Unit 7 Bacchus House, Calleva Park, Aldermaston, Berkshire RG7 8EN. Company Reg. 3026230. Specialist supplier of insulated manual roller garage doors or automatic roller garage doors for DIY installation or with UK fitting service. First for diy roller garage doors Reading, Birmingham, garage doors Newbury, Oxford, Manchester, Slough, Ascot, Windsor, garage doors Maidenhead, Bracknell, roller garage doors Wokingham, Guildford and Basingstoke.